Chain link fence can be very useful on any property. 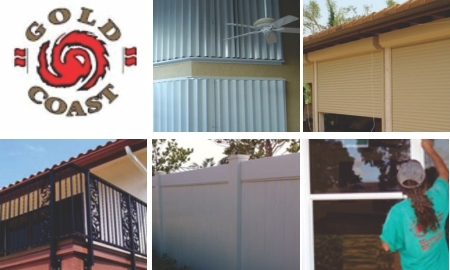 Gold Coast Hurricane Shutters and Fence has been in business for over 20 years, and has the experience necessary for making a sturdy, reliable chain link fence. We are committed to 100% customer satisfaction and will custom tailor our products to your needs. We know our products are of the highest quality because we manufacture them ourselves. Chain link fences can protect a house or be put around a basketball court. We can make a custom kennel. Our engineers work exclusively with aluminum and make the best chain link fence in the Tri-County area. Not only that, but we have the best men on the field for installation. Fence and Railing manufacturer for many home builders, Homeowners and commercial manufacturers. We offer the best selection of Fences, Hand Rails & Railings. All Chain Link Fence needs can be quickly fulfilled by us at Gold Coast; we are the experts with tremendous experience, and substantial resources, and ready to handle your specific needs. We have been proudly serving Broward, Palm Beach and Miami-Dade Counties, with our Gold Coast fencing products; everyone loves them, and so would you! Price, colors, design, style, workmanship; we will please you on all fronts. And remember, you can have your fence green or black vinyl coated. Additional deterrents can be added, like razor wire, or barbed wire. And if you need expedited service, we can meet that demand as well. Gold Coast Hurricane Shutters and Fence is South Florida's leading supplier of residential, commercial, and industrial chain link fence, gates, railings, and handrails. You know our hurricane shutters are strong, and we pride ourselves on making only the highest quality, most durable, and reliable products. Custom work is always available. We will build you gates to match and co-ordinate with your fence. Whenever you need that chain link fence, we will manufacture it and install it without a hassle whether it's at your sports complex, your school building, your church, day care center, warehouse or industrial complex.